Why cholorophyll appears green in color? What are the products of photosynthesis and their uses ? Why glucose is an important food source ? Explanatory notes section explains in detail chloroplast, chlorophyll, glucose etc. 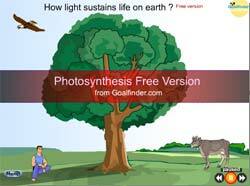 The word photosynthesis means "making with light "-plants need "energy" from sunlight to survive. To do this they also need the green substance chlorophyll and the raw materials: water and carbon dioxide. Chlorophyll is found in the chloroplasts (small round structures) of the leaf cells where most photosynthesis takes place. 2) carbon dioxide from the air through pores in their leaves. glucose and oxygen. All animals depend upon these products .They use oxygen for respiration and glucose for food. why chlorophyll looks green making all plants look green in return ? Chlorophyll looks green because it absorbs red and blue light, hence our eyes only see green reflected back, making chlorophyll appear green. 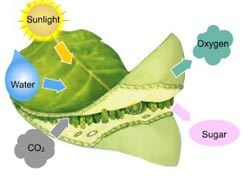 However the red and blue spectrum energy makes it produce food .The green light that we see is not absorbed by the plant, hence cannot be used for photosynthesis. Photosynthesis starts when the chlorophyll molecule gets ionized by light resulting into release of two electrons, This leaves chlorophyll with a deficit of electrons, so it uses water (another reducing agent ) to produce the life giving oxygen. Ans: Click on the free download icon in yellow given under "Product-Animation"
Ans: Chlorophyll can transfer the absorbed light energy, from molecule to molecule of chlorophyll, and sometimes from certain other pigments to chlorophyll. Photons of light that are picked up by any of the pigment molecules in the antenna pass their energy to nearby pigment molecules until it is eventually passed to a special molecule of chlorophyll “a” called the P700 reaction center. The reaction center chlorophyll molecule becomes ionized and loses its electron to an electron acceptor thus it becomes oxidized. Ans: In a leaf besides chlorophyll, there are other pigments like carotene, xanthophylls, tannins ( a waste product) and anthocyanine. Chlorophyll masks all other pigments. In the fall season the supply of water from tree to leaf is cut and chlorophyll begins to disappear. Other colors which have been subdued due to chlorophyll become visible orange from carotene, yellows from xanthophylls, bright red and purple from anthocyanine and brown from tannins, different combination of these pigments give us a wide range of colors including brown. Ans: Photosynthesis is an energy conversion process carried out by living organisms where light energy is converted into chemical energy. The source of light energy being the Sun with added on raw materials - carbon dioxide and water. These are converted into glucose and oxygen by photosynthesis. Nearly all forms of life depend on this process for food, making it one of the most important processes. Ans: Refer http://zoobank.org/ or http://www.iczn.org/ for zoological and http://www.bgbm.org/iapt/nomenclature/code/SaintLouis/0001ICSLContents.htm for botanical names.